Today I received the delivery of these two books. 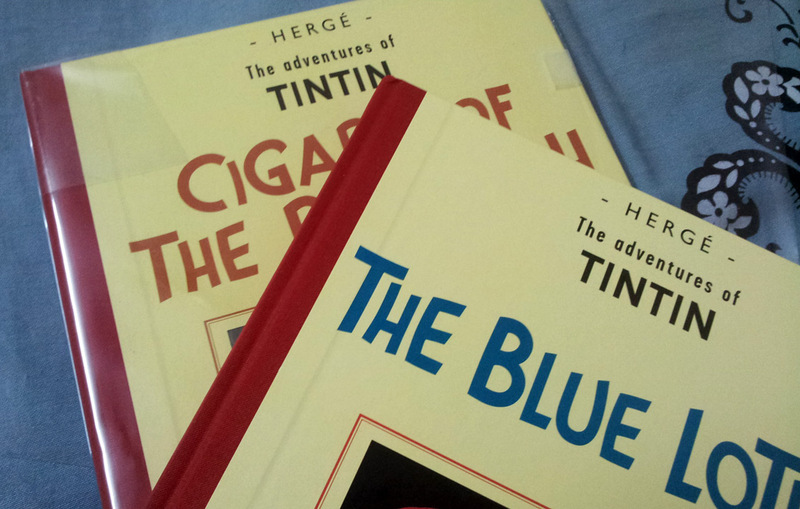 These are the original black and white editions of Cigars of the Pharaoh (1934 version) and The Blue Lotus (1936 version) by Hergé. As usual I have put my own version of transparent dust jacket to protect the books. At about 25 USD each, these aren’t that cheap and I believe are targeted at collectors. I will do a detailed write-up of each later. I will also do a comparison with the standard editions available in the market. There are some sparse coloured pages sandwiched in between pages filled with black and white line drawings. I have one complaint right off the bat. The hardcover is really a very generic library binding with thin printed paper (the cover art) glued on top. As a result, only the cloth is visible at the spine and there is no way you would know which book it is if viewed from the side. Is it to preserve some sort of authenticity that I am not aware of? Check the following image to know what I am talking about. 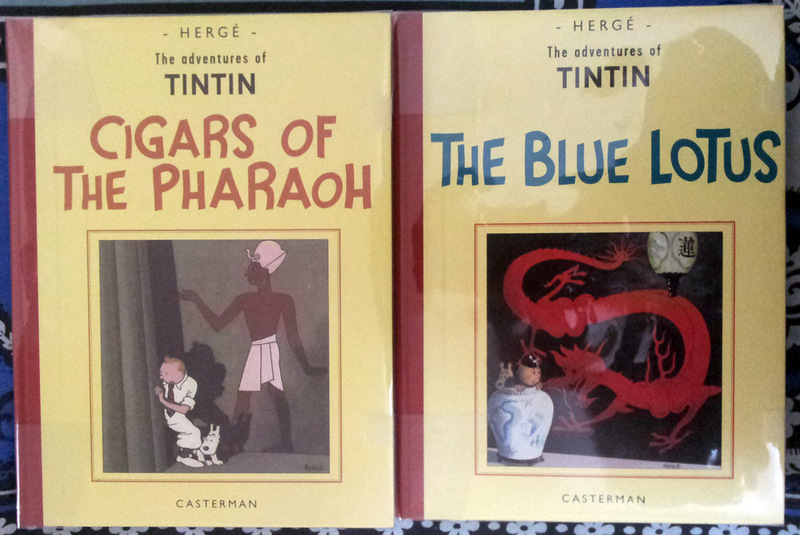 The Blue Lotus is without my transparent dust jacket and the paper cover glued on cloth binding is clearly visible. I wonder where can I get hold of the following books Casterman mentions on the back cover? I presume these are the original black and white facsimile editions. 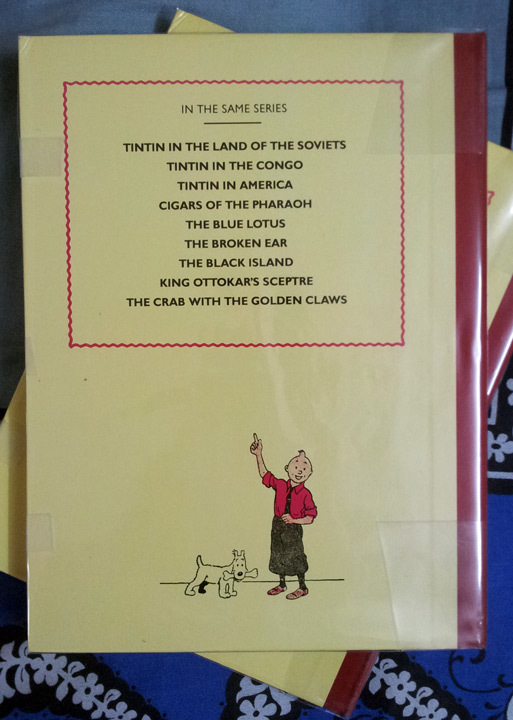 So far I could only track Tintin in America (1934 / 1936(?) version. I might get that in the coming months). I am also very much interested in the B&W edition of The Black Island.